Roger and Jessica Rabbit walk amongst the fall-colored trees, with their gold and brown leaves. 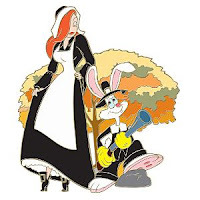 Roger and Jessica are dressed as pilgrims, wearing traditional black and white attire. However, Jessica has black heeled shoes with gold buckles.